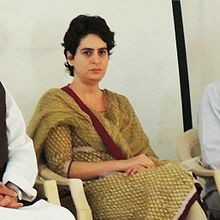 Priyanka Gandhi vadra is the wife of Robert vadra, daughter of late sri rajiv Gandhi ji- former prime minister of India & also her mother is smt. Sonia Gandhi ji. She is the Grand Daughter of late Smt. Indira Gandhi ji. Jupiter ascendant and Jupiter sits on its own house. So blesses her with good dharma and good human being qualities. Give protection to her relationships and marital life. She will have a sensitive heart for lesser privileged people. Also note she is 12th born- that is 1+2=3 – Number of planet Jupiter. Giving her all the good qualities of a good human being . She has a raja Yoga of strong sun in first house or lagna from 9th house( house of Luck and fortune). So she is blessed with good inheritance and fortune. The lord of her career( politics) is in trines in lagna- along with Jupiter and sun ruling 9th. So she could do well in her career/politics. Mercury also gives her good enough communication skills. The planet Venus is in 3rd house and rules ari bhava(6th house) aspects 9th house- house of father and also is enemy of sun the lord of house of father. This year could be extremely hard and problem prone for her. With unexpected matters coming up and a lot of work and restrictions. May could be tough and so could September 2016. The malefic mars-Saturn conjunction in transit is in her 12th house with moon- so mental anguishes/stress and anger could be there due to this transit. Aspect on 7th house of husband gives trouble to husband- we know about the stress he(Mr. Robert vadra) had to recently face for Income Tax /DLF and others issues. Rahu-Jupiter conjunction in transit in 9th house- could take her more towards religion. Smt. Sonia Gandhi ji, The Charismatic Indian Congress Politician –what waits her in 2016? 2016 Horoscope Predictions! Smt. Sonia Gandhi ji, what do her Numbers Say -2016 Forecast 2016?